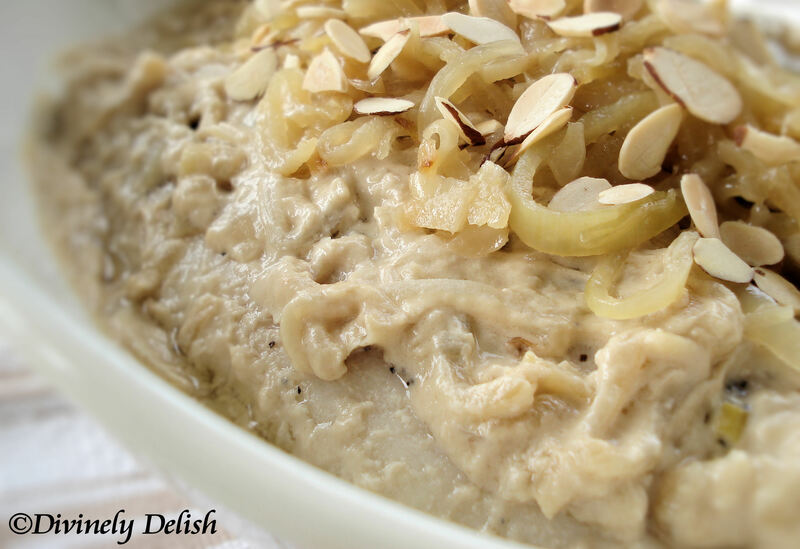 Here’s another great recipe that I got from my Lebanese colleague and amazing cook, Jamalle. You might remember that she also shared her Tabbouleh recipe with me. The first time I tried Samak Tajin was at a potluck lunch that we had at work. It was, quite simply, love at first taste! We were all asking for the recipe. I’ve had fish baked, BBQ’d, steamed, fried, but never prepared in such a manner. 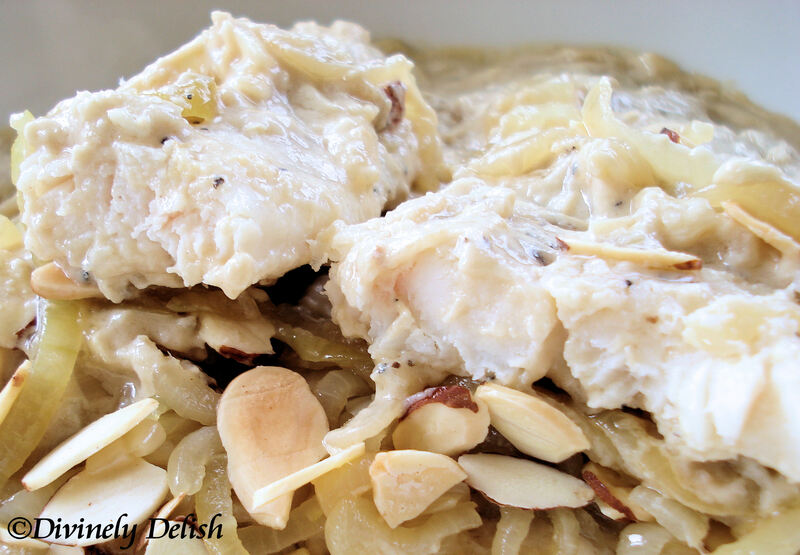 This dish is a wonderful, unique combination of flavours – the tender fish fillets mixed with the creaminess of the tahini, the tartness from the lemon juice, and the sweetness of the caramelized onions. I’ve made this a couple of times, and everyone just loves it. You can have it hot, or, eat it slightly cold/at room temperature, which is how I like it. So, if you’re planning a BBQ or picnic this summer, and you want something a little more exotic than potato salad, why not try making Samak Tajin? It makes a delicious cold appetizer when eaten with pita. 2) Place prepared fish fillets in baking pan. Bake 15 minutes, then turn fillets over and bake another 15 minutes. 3) While fish is baking, saute onions in olive oil in a large pot. Fry until soft and brown. 4) Take out half of the onions and put aside. 5) In a bowl, mix together garlic and salt. Add tahini, water and lemon juice. Mix well. 6) Pour tahini mixture into pot with the onions. Cook for a few minutes, and allow to simmer for one minute. 7) Place fish on serving platter, and pour onion and tahini mixture on top. 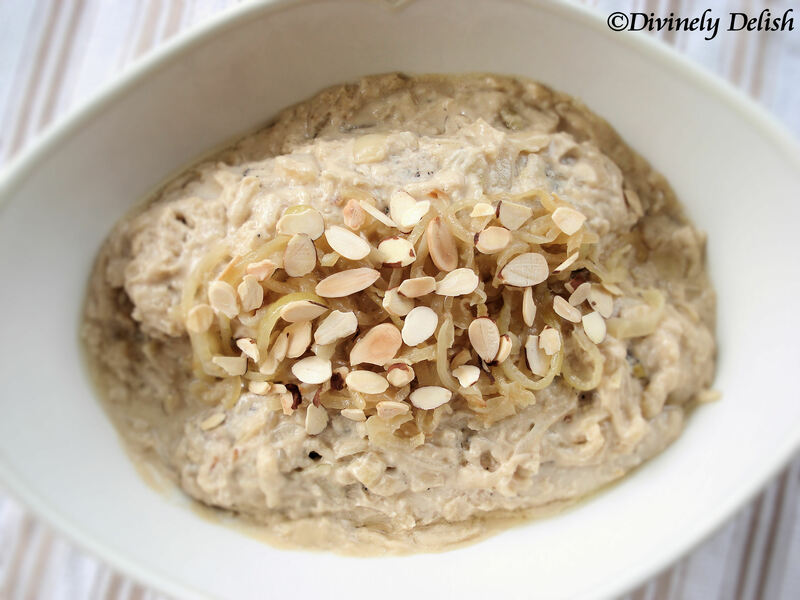 8) Garnish with the remainder of the onions and pine nuts or almonds. 9) Serve hot or cold/room temperature.